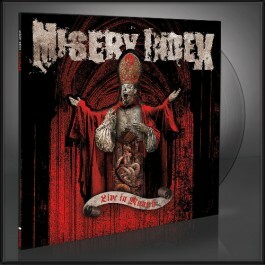 MISERY INDEX have firmly established themselves as a top institution for brutal Death Metal paired with crushing Grindcore. Having relentlessly toured on every continent, the US band has created a massive following. Every MISERY INDEX show is a celebration of pure anger harnessed only by the merciless precision with which the guitars churn out massive riffs and the relentless pounding of their rhythm section. “Live in Munich” is a perfect document of this raw energy and a fitting tribute to the band’s steep rise within the Metal scene since their founding as a studio project in 2001. After four best selling studio albums and several EPs, MISERY INDEX now release their first live album captured professionally in all their furious intensity on the “Full of Hate Tour”. “Live in Munich” gives their loyal crowd a perfect break in their most eager wait for new full-length expected in 2013 on Season of Mist.